A proposed housing development along Pembina Highway may bring some relief to homeowners surrounding the University of Manitoba. 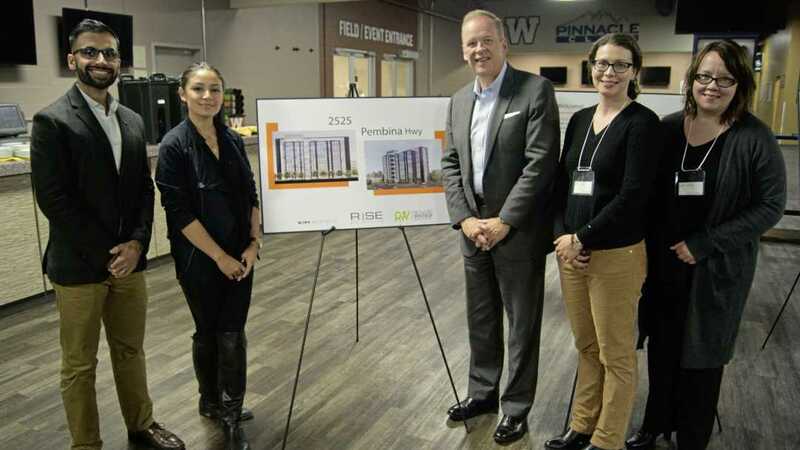 Rise Real Estate, an Ontario-based developer, has plans to build a 14-storey student-oriented rental development at 2525 Pembina Hwy. An artists rendering of the development at 2525 Pembina Hwy. The development would feature 197 suites, underground parking, bike storage to accommodate hundreds of bikes, and a parkette that hugs onto existing active transportation pathways. What’s different about this development is the rental model. Tenants rent a bedroom within a suite (on average between $450 and $650 per month) and share the apartment space with others. On average there are three bedrooms per suite. The development is being billed as an affordable alternative for students who have limited housing options in neighbourhoods surrounding the University of Manitoba. Illegal rooming houses — homes that don’t have proper zoning for multi-family use — have been popping up in communities around the university, causing grief for neighbours who have seen their street go from single family dwellings to rental units and upkeep diminish. Vice-president of business development with Rise Real Estate Brian McMullan said this housing model has been effective in other markets and university towns. In the past five years Rise Real Estate has built more than one of these apartment complexes in both Waterloo and London, Ont. “I know many communities across Canada have expressed concerns about the impact (of students) and this simply provides an alternative for students in terms of quality accommodations,” he added. Rise Real Estate has plans to build similar developments in Guelph, Ont., Hamilton, Ont., and Edmonton, Alta. However this is the first development for Rise Real Estate in Manitoba. There is no firm estimate on the total cost of the development, but McMullan said it represents a $50-million investment in the area. “We’re excited. We think this is a great market and there’s a need here and it’s a great school to be associated with,” he said. Coun. Janice Lukes (South Winnipeg-St. Norbert) said the proposal is an interesting use of the property and a possible solution to the housing shortage. “For me, I think it’s a very viable solution to a big problem that we’re having which is a shortage of housing in and around the university,” Lukes said. Rise Real Estate will still have to submit applications to the city for a rezoning and to purchase a parcel of city-owned land. If everything moves forward as planned, officials say they hope to appear at a public hearing late this year or early 2016, and construction could begin as early as spring 2016.